The above clip shows some of the unbelievably far reaching possible impacts. The clip feels highly optimistic. Compare it to the one below. It involves a range of techniques to produce new life forms, forms untested by the challenges of evolution. Quakers, grounded in our values of peace, integrity, equality, simplicity, and respect for all creation, have an important role to play in response to synthetic biology. We are one of the faith communities that is most actively following developments in this field. 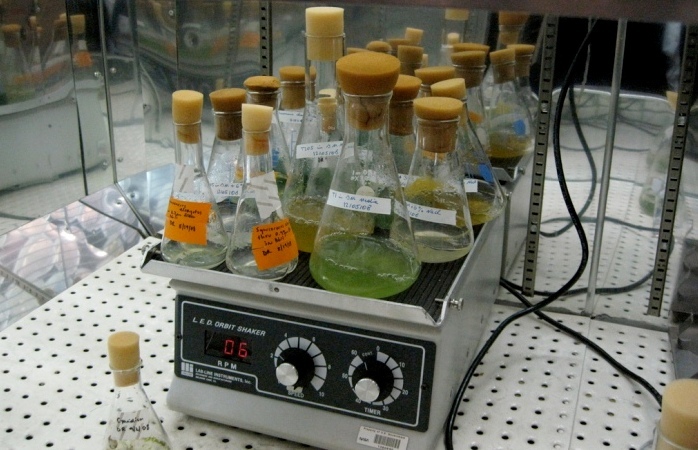 How do we address the spiritual concerns regarding synthetic biology? e.g. the sacred in living beings and nature in relation to synthetic biology, the valuing of technology as compared to human wisdom and inner truth. We distilled our thinking down into the 2017 position paper Synthetic biology: major issues of concern to Quakers. 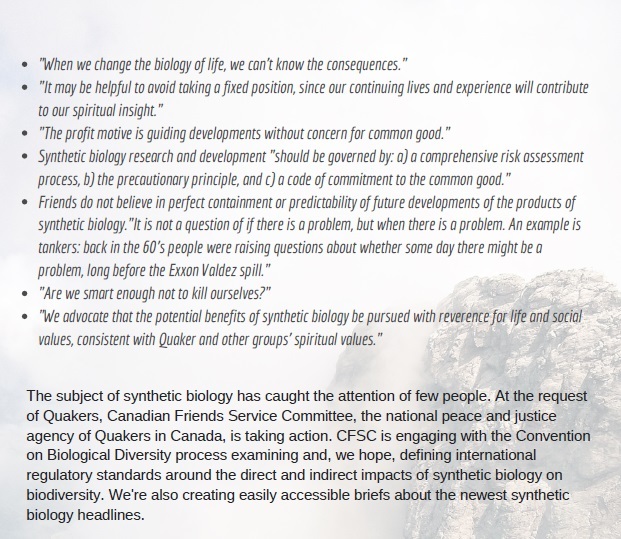 The Winter 2016 issue of Quaker Concern pages 4-5 and this 2014 blog post offer two additional opinions about the connections between spirituality and synthetic biology. Protect economic and environmental justice. Encouraged us to engage with other faith groups and interested parties, including organizations involved in research and/or manufacture in synthetic biology, to hold and/or participate in conferences that address ethical, spiritual, social, and economic aspects of synthetic biology. The metaphors of cells as machines or DNA as computer code are ubiquitous. How do these metaphors help or limit our thinking? How did Quakers form their positions on synthetic biology? 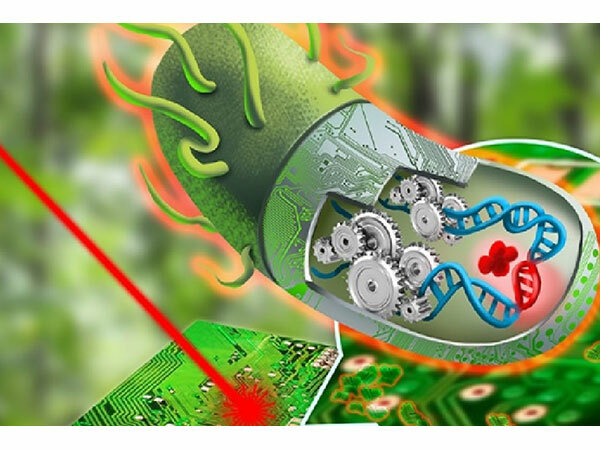 In 2013 we put together a kit of background information about synthetic biology (while the world has changed a lot since then, much of this is still relevant today). We heard back from 10 Monthly Meetings from across Canada who formed study groups to discuss these issues. Some of what they said is available in the double-sided handout Quakers & Synthetic Biology. Annapolis Valley Monthly Meeting‘s study group developed an agenda template which you may find useful when considering synthetic biology. Many commented about the far reaching and overwhelming implications of all of this, and how daunting it can seem to begin a conversation. So the agenda template should be a big help! 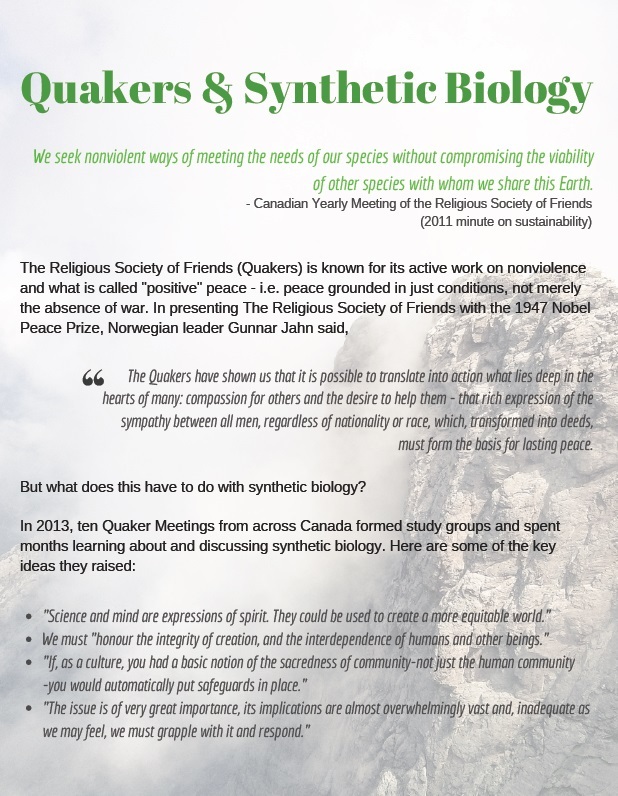 In early 2014 CFSC members and associates produced a Background Report on Synthetic Biology which weaves together the common responses we heard from Quaker Meetings. In addition to our own work, Quakers have played an active role in the Faith and Life Sciences group of the Canadian Council of Churches, which has published a thorough curriculum for churches to assess the impacts of biotechnology – When Christian Faith and Genetics Meet. So how did biotechnology originally grow into such a concern for Canadian Friends? The story is actually a good way to illustrate the development of a concern within the Quaker community. Anne Mitchell, CFSC associate member for biotechnology concerns, began representing Friends on this issue when she joined the Canadian Biotechnology Advisory Committee (CBAC; established in 2000). Anne brought a concern about patenting of higher life forms – the oncomouse, a mouse genetically modified for cancer research – to Canadian Yearly Meeting in 2002, having tested it at her local Meeting. A minute was developed, “What is it in nature and in human knowledge that we have the right to own?” Anne brought this to the Governing Board of the Canadian Council of Churches (CCC). The Governing Board decided to intervene before the Supreme Court of Canada on the issue of patenting of the oncomouse.